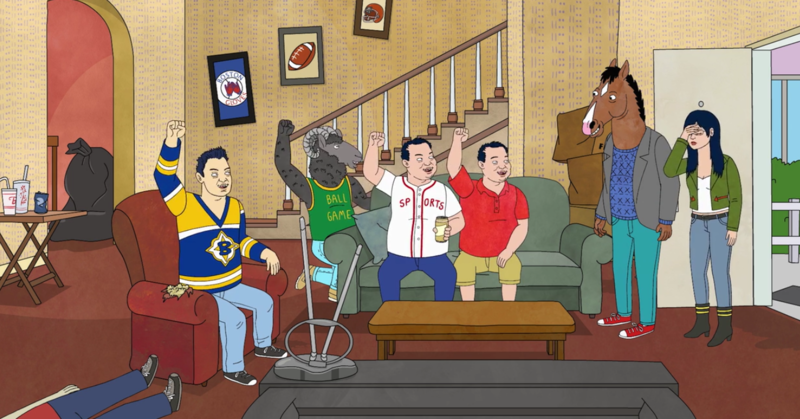 When “BoJack Horseman” débuted, in 2014, it didn’t look particularly original. It was the hundredth series about a middle-aged man—well, a horse, but still—who did bad things. It was the latest scathing portrait of the downside of fame. It was the newest streaming dramedy: yet another adult animated alt-comedy meta-sitcom. In an anti-antihero frame of mind, I took much too long to catch up on what turned out to be one of the wisest, most emotionally ambitious and—this is not a contradiction—spectacularly goofy series on television. Created by Raphael Bob-Waksberg, illustrated by the brilliant Lisa Hanawalt, and airing on Netflix, “BoJack Horseman” is a world-creation show, merging bleakness and joy. Like “The Simpsons” and its best descendants, “BoJack Horseman” uses animation to imagine a teeming, surreal alternative universe—in this case, a place called “Hollywoo,” in which animals and humans live side by side. BoJack, a former sitcom star, is a horse in a Cosby sweater; Diane, his sardonic biographer, is a human. Diane’s husband is a dog; BoJack’s agent is a cat; a bunch of whale strippers give lap dances in “the blowhole room.” Easily half the gags are silly animal puns, verbal or visual, like Broadway posters for “Fun Ham,” kangaroo bellhops, or a painting of Manet’s Olympia as a shark. The sheer density of these giggle-inducing, collect-them-all punch lines gooses the show’s more harrowing themes, as if Nathanael West had written “Miss Lonelyhearts” in puffy glitter ink. The basic story is this: In the nineties, BoJack (voiced by Will Arnett) was the star of a network sitcom called “Horsin’ Around,” a hacky “Full House”-like series about a bachelor raising orphaned kids. Since then, he’s become a famous has-been, marinating in self-pity. This particular form of show-biz pathology has been explored a few times before; namely, in “The Larry Sanders Show.” In another familiar TV trope, in the first season BoJack fell into a love triangle, with Diane and her husband, Mr. Peanutbutter. The season took some gorgeous existential leaps, particularly in the second half, but had it stuck entirely to the P.O.V. of BoJack, a dyspeptic, near-suicidal know-it-all, it might have felt airless.